We have some wonderful horsemen to learn from here at Crown Valley. If your child chooses to be involved in this program, they will learn the basics of horsemanship. Each of our mentors are trained and ready to teach your child the skills and safety they will need to ride a horse. 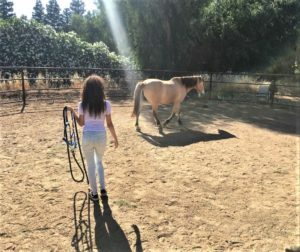 We believe that horses are very therapeutic animals that give children a chance to open up in ways that they may not be able to with people. Our Horticulture program is perfect for the kids that love to garden. We use the square foot gardening technique, which allows kids to have their own garden box to take care of. They will learn how to garden and harvest a variety of flowers and crops. In Arts & Crafts, there are so many different activities your child can do. We offer painting, drawing, crafting of any kind, woodworking, and much more. Anything you can craft, we offer. Our small animals department is a wonderful place for animal lovers. We have a pig, sheep, alpacas, goats, and donkeys. Your child will be able to learn more about these animals and also the proper way to care for God’s creatures. If your child loves nature then this program would be a great start to introducing them to the outside realm. Here is where your child will learn the basics of outdoor survival. We also take hiking trips in the Sequoias that our CVYR kids can participate in. If your child likes bugs, bring them here. Our Creepy Crawlies program was designed for those who love insect and reptilian species. First you must fill out an interest form. To access this form online, click here . If you have any further questions, feel free to email our Director, Aaron.